I’d only heard of Aveeno baby products from friends living abroad. Not until I had a baby would I think of finding ways to get them to India for me. But looks like Johnson & Johnson answered my silent prayer and launched the Aveeno baby products range here in India a few weeks ago. I was thrilled when I was sent one of their products to try out and review. In all honesty, I’d rather try out the product on myself for two weeks before introducing it on #BabyHashtag and then making a committed purchase. 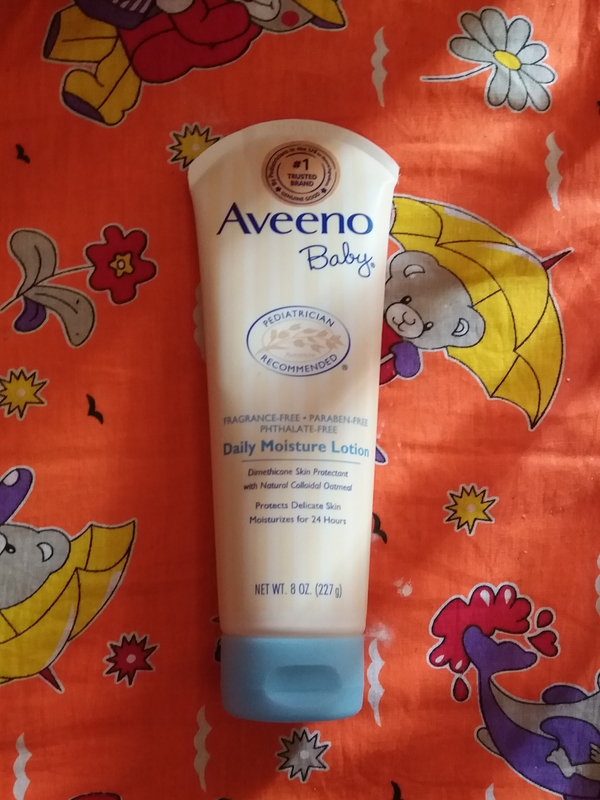 I received the 8 oz variant of the Aveeno Baby Daily Moisture Lotion. The lotion contains natural colloidal oatmeal and is super mild on a baby’s delicate skin. It is also paraben free, phthalate free, steroid free and is hypoallergenic. The Aveeno Baby products are also pediatrician recommended. First up, let me talk consistency. While the product description says it is a lotion the consistency of the product is quite thick. It is creamy and smooth and the texture does not feel sticky at all. It took me a couple of ‘ketchup bottle’ style pushes to get it out. The non fragrant lotion is mild on the skin and leaves little to no residue on the skin when applied. We live in a place that is mighty humid and so a lotion that leaves any residue makes us unhappy but with Aveeno there is no complaints at all. Plus one for the formulation. Even though it is thick, it spreads evenly and moisturises the skin deeply. 1. The Packaging is love! The fact that there is pastels incorporated in the packaging is alone a big win from me. I do not know about other babies but #BabyHashtag is picky when it comes to care products and how it looks matters a LOT. 2. Paraben free and Phthalate free. It is hypoallergenic and super soft and so can be safely used for newborn babies as well. 3. If you are a parent and an advocate of baby products that are fragrance free, this one is for you! It really is completely 100% fragrance free. 1. Ok, this might be a dampener but I like a little bit of fragrance in the baby products we use. Nothing too right in my face strong but gentle mild fragrance would be nice. The fact that Aveeno Baby Daily Moisture Lotion is completely fragrance free makes it a tad bit less appealing to me. 2. The price point is slightly higher compared to other baby products in the market, if I have to point it out. Yes! I am definitely buying the rest of the Aveeno Baby care range because this Daily Moisture Lotion has spiked up my interest. I would give it a total of 4.5 stars out of 5. If you are still wondering if you want to buy it or not, stop contemplating and just go for it. A thorough review. I love that they don’t have fragrance but as you pointed out it’s individual tastes. The cream is especially great for winter months. I’ve never had the opportunity to try Aveeno. Both my kids have atopic dermatitis and it’s like walking on egg shells in winter. I’ll be able to recommend Aveeno to friends thanks to your review. I kind of like the fact that they don’t have a fragrance, but agree with you on all the other points. It’s a great product. Aveeno is a great brand; I have used some of their products in the past. For my son, we have been using Sebamed, but might give Aveeno a try too. Thanks for sharing your review. We love Aveeno for Mama and baby!! Thats such a detailed review. I am definetly buying Aveeno’s next. And do love its packaging too. Great review.. have been reading such great reviews of Aveeno.. i should definitely give it a try now. Your review of the baby lotion is very balanced and honest. I too was a little taken back by total lack of any fragrance in the lotion. I have used Aveeno Baby Body Lotion for my kids and I liked it a lot. The most appealing thing is that it’s non greasy and doesn’t leave any residue behind. I am going to buy Aveeno baby as soon as we are out of our baby care stocks, have been hearing a lot about this. Thanks for sharing your review. Aveeno products are the best and this baby lotion is very good. Tried and tested products. I swear by Aveeno. It has helped relieve babyT of his eczema woes. No other product worked for me ever. I am truly indebted to Aveeno for this product. a wonderfully detailed review! I am going to try this one next time and see if it works for us too!